The S3ADS1M10BT40ULP is an ultra-compact and low power 10-bit SAR ADC IP with a sampling rate up to 1MS/s and an analog Mux for 8 single-ended input signals. 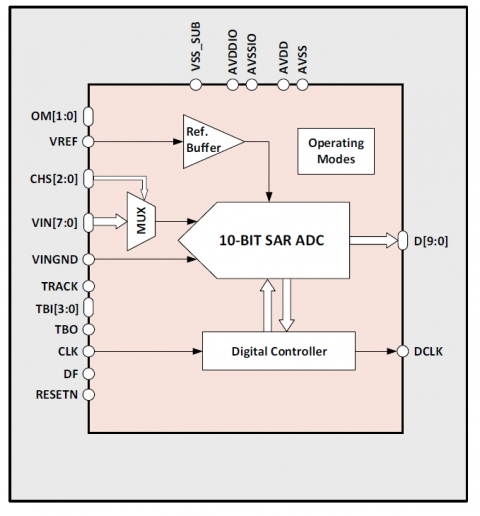 This 10-bit ADC features an outstanding dynamic performance that includes 55.3dB SNR, 65.0dB SFDR and 8.8-bit ENOB. It also features an outstanding static performance with < ±0.9 LSB DNL (no missing-codes) and < ±1.4 LSB INL. This high-end performance is obtained with 20uW only total power dissipation. For application flexibility, this IP includes a Reference Buffer to drive the SAR ADC capacitive DAC. The S3ADS1M10BT40ULP can be cost-effectively ported across foundries and process nodes upon request.